Cool Gear is a company that sells kitchen products designed to keep your food and beverages hot or cold. Here is some information about the company: "We at Cool Gear International, Inc. pride ourselves on our reputation. Since 1986, we have been conceptualizing and developing ideas, turning them into products and bringing them to the marketplace. We deliver innovative and imaginative products to the marketplace while providing a 100% customer satisfaction policy." For my review, I was sent the StayFit Deluxe Salad Kit. It retails for only $8.99. There is room on the bottom for salad, on the top for other veggies, and another space for salad dressing. I love it! For many lunches, I love to take a salad to work and it always gets soggy. 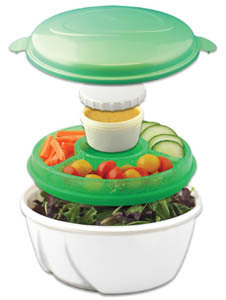 This container helps to keep the salad separate from the dressing and keeps the food cool! I was also sent the 19 oz Eco to Go Coffee Cup. This has an EZ grip band for easy holding. It also has a double wall construction and a spillproof design. For work, I love to take tea or coffee with me in the morning and this helps to keep it hot the whole way. It retails for only $9.99. I love both of the products that I was sent and think that the company has many other cool ones that I would love to try. Check out Cool Gear for products that helps to keep your food on the right temperature. Great review! The bowl is really neat. Thanks for sharing! I love it because it works and is cheap! Nice appearance and makes sense ! Nice Review Thank you ! That is a great deal for that salad kit. I thought it would be at least $15. I am a new follower from The Mingle Monday Hop. If you have time and can stop by http://messforless.blogspot.com I'd really appreciate it.